Welcome to our page for Students and Grants! This includes information on our Annual Scholarships, grants and full details on how you can apply with the potential to be awarded a scholarship! KNOW our applications are here ONLY from January 30 through April 15 Annually. HERE WE GO … Get ready to apply for 2019 Educational Scholarships in our four -4- Different areas. Without the support of you, Our Hero’s, we might have to do budget cuts so we sincerely hope you help us so we can help Florida Kiddos and businesses! Support is needed as Donors; Event Sponsors; Auction Donations; Event Attendees; and monetary support in any form. Our Scholarship Applications and Guidelines are Posted In January Annually for perusal, IF Students or Parent’s have any questions or concerns please email o2bfun@yahoo.com for a pdf version of these scholarship applications! 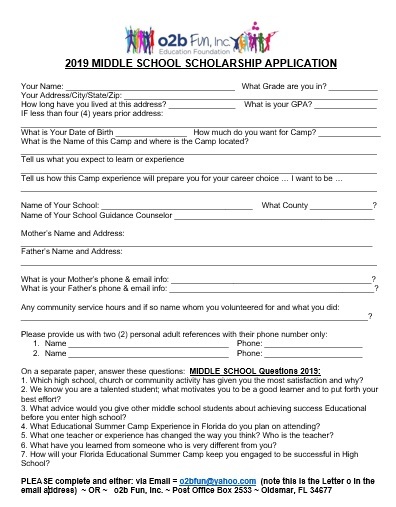 GUIDELINES FOR EDUCATIONAL SUMMER CAMP SCHOLARSHIPS? Your child must be attending a Tampa Bay Area School during the current calendar year. Your child must be attending in the fall a School in the Tampa Bay area. Your child must live within the Tampa Bay Area. Your child must complete the “School Application,” on our website and return via email or US Postal mail no later than April 20 of current school year. Your child must provide a photo of their choice that will be posted on all social media and blog site IF they win. Otherwise the photo will not be posted. Parents must agree to have their child’s photo on all social media and blog sites of o2b Fun Inc.
Each student is requested to provide a 3-5 sentence testimonial of how they spent their monies after they return from their Educational Summer Camp Experience. All Funds Must be used toward a Florida Educational Summer Camp experience and Must in the application state which Florida Educational Summer Camp experience they wish to attend. GUIDELINES FOR COLLEGE BOUND SCHOLARSHIPS? You must be planning to attend a Florida College in the current calendar year in the Tampa Bay area. You Must live in the Tampa Bay area. 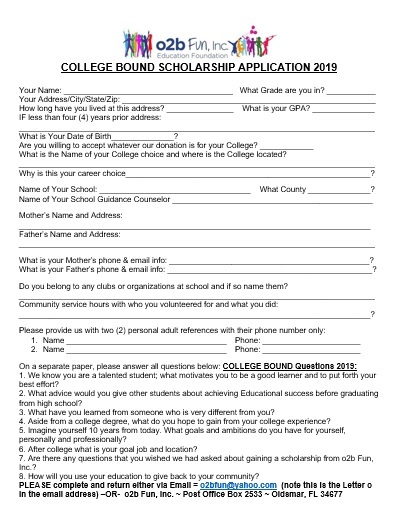 You must complete the “College Bound application,” on our website and return via email or US Postal mail no later than April 20 of current calendar year. You must provide a photo of their choice that will be posted on all social media and blog site IF you win. Otherwise the photo will not be posted. Each student is requested to provide a 3-5 sentence testimonial of how they spent their monies after they have received their College Bound Scholarship funds. All Funds Must be used toward a Florida College and Must in the application state which Florida College they wish to attend. GUIDELINES FOR “SHEP” TECH SCHOLARSHIPS? You must be planning to attend a Florida Tech school during the current calendar year within the Tampa Bay area. Each student is requested to provide a 3-5 sentence testimonial of how they spent their monies after they have received the “SHEP Award” funds. All Funds Must be used toward a Florida TECH and Must in the application state which Florida Tech they wish to attend. You must be attending a Tampa Bay Area High School during current calendar year. You Must Currently be in the 11th Grade of High School. All Funds will be used toward a Summer Culinary Working Experience to gain Experience and Knowledge from Award Winning Michael Lamando and his team at Amici’s Catered Cuisine. Annually we honor Michael Sheppard’s memory by granting one student the SHEP Award which is a scholarship to a Florida Technical School so if you are interested in continuing technical skills be sure to apply! 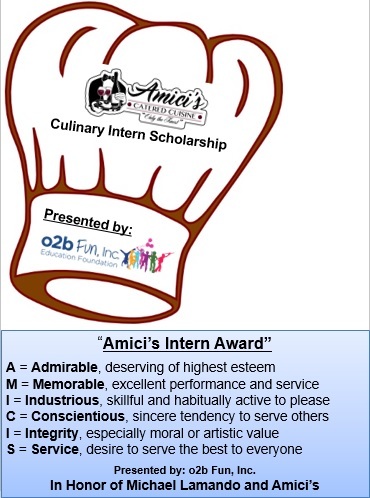 PLUS NEXT YEAR … 2018, we will begin the Annual Amici’s Culinary Intern Scholarship for All Culinary Students in the area to apply for! YEAH 2018 Scholarship Winner’s! testimonials are in each students own words! Logan, Hillsborough – I was thankful to attend the Fine Arts Summer Academy offered by the Annie Moses Band. I learned more acting and vocal techniques, and met many talented musicians. Thank you to all who support o2b Fun and choosing me to win. Riley, Orange – This whole week has been so much fun filming with new friends. I loved being a part of the film and Brad is so good at teaching us important things for film while still having fun! I have learned so much and this has been the best week of my summer, thanks to o2b Fun for allowing me to win a scholarship! Cathy, Hillsborough – Computer Science is my interest and thanks to o2b Fun, Inc. I enjoyed summer camp and look forward to taking on high school. Malakai, Pinellas – I think I have great Leadership skills and used o2b Fun Scholarship to attend Countryside Christian Church Summer Camp to enhance my Leadership skills and making new friends while learning more. Colin, Pinellas – YMCA summer camp is what I used my o2b Fun Scholarship funds for and enjoyed Helping students with Autism as well learning from them. I hope next year I get to be a leader at the Autism camp and gain even more knowledge for my future. Max, Pasco – Thank you to o2b Fun for allowing me to win a scholarship where I went to my Church Summer camp to learn, grow in Christ while learning more Computer Science skills. Rosa, Hernando – Horticulture is what I truly love the most in the simplicity of life. Because of the supporters of o2b Fun, I got to learn more new skills to help both People and Animals using local Horticulture ideas. Lily, Hernando – I chose to use my o2b Fun scholarship money to attend Countryside Christian Church Summer camp. I learned so much as well got more friends to socialize with so thank you. Jose, Pasco – Criminology is what I really want to make my future. As a son of a single mother I see the stress and struggles she has been in/through and when I go to college I want to be a Criminology attorney to help other single families. Bryanna, Pinellas – College School of Health Science for Healthcare is where I spent my o2b Fun Scholarship and I know without the help all supporters I would not have been able to attend this college so thank you and for helping my parents allow me to fulfill this education. Danielle, Hillsborough – College School for Business Counseling at Hillsborough College is finally a dream come true and thanks to all who support o2b Fun, Inc. for allowing me this dream come true. Katy, Hillsborough – College Biomedical Engineer at USF is where I spent my scholarships and excited to learn, grow then help my area when I graduate. Thanks o2b Fun Hero’s as Brenda call you guys. Susan, Pinellas – School of Nursing at USF is where I will be spending my o2b Fun Scholarship and looking forward to working to help all those in need in my area upon graduation. Thank you to all who give and support! Steve, Hillsborough – Thank you for the SHEP TECH Scholarship as Steve will be attending Pinellas Tech School and on his way to working on your vehicle. As a single mother, I thank you all for granting my son this scholarship! 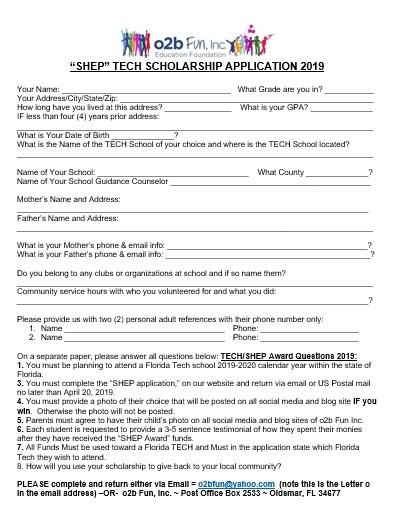 Dan, Pasco – I am excited to be the recipient of this SHEP TECH Scholarship and will be attending my local technical school for automotive thanks to all who made it possible at o2b Fun. Dakota, Pinellas – Thanks to all who made this possible for me get to go to college for Marketing and Baseball to become productive in my local area. Excited to graduate and give back to both local students wanting to be better in sports as well marketing knowledge. Rashawn, Orange – Thanks for the o2b Fun College Book Scholarship which will help me in college expenses. I promise to make you all proud! 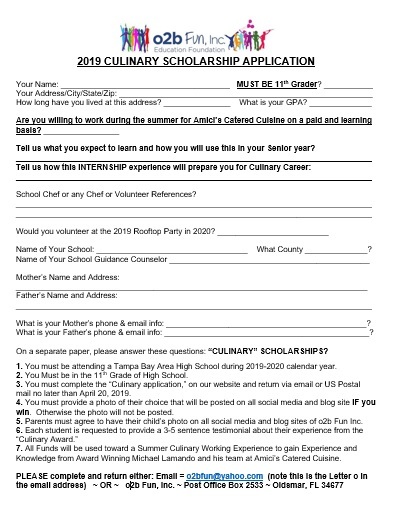 OTHER Scholarships = Leto High Culinary Program; Ozona Christian School; Oldsmar Christian School; Azalea Middle School; St. Pete High School; Faith Global School; Countryside High School; Plant High School; Miss Suda’s Dance School; Make Them Matter; Countryside Cares Pantry; Oldsmar Cares; ALS; Relay for Life Oldsmar/Safety Harbor; RCS and New Life Solutions Pregnancy Center. CONGRATS to all our 2017 Scholarship Winner’s! testimonials are in each students own words! ASHLEY (Pinellas) Attended Naples Nature’s Wonder Summer Camp Program Lead by The Ritz-Carlton resort Conservationists! During the day enjoy hands-on discovery programs in the Nature’s Wonders facility that utilize a science-based curriculum and kid-sized lab, complete with microscopes and visual stimuli like preserved reptile skeletons. All the tools to help a marine biologist stay engaged. VERONICA (Sarasota) NASA’s week-long sessions she experienced space flight on motion simulators, meet and talk with a real live astronaut. She rode the Shuttle Launch Experience and participated in Team-building activities that provided her the chance to perform a space shuttle mission simulation and brainstorm ideas for future space travel. JACOB (Polk) Jacob attended the Zookeeper camp at Busch Gardens, from Sunday through Thursday. Students are up early to fed and learn what the life of a Zookeeper is about by cleaning, feeding and learn about conservation and work together to improve it. LIYANA (Hillsborough) Attended Clash Camp for one full week at Camp Kulaqua and learned teambuilding with Christian classes. Hunter (SHEP AWARD) Attended and completed PTEC for automotive training. Hunter will be taking over his family’s automotive shop ensuring Fowler Automotive stays in the family for the Third Generation! Noelle (Pinellas) Is using her funds to attend St. Pete College with gratitude to all those that support o2b Fun Inc. which enabled her to attend college. Sandra (Manatee) I will be using her funds to continue her love of art by attending The Art Institute of Tampa. Thank You for believing in me! Damarcus (Pasco) will be using his funds to attend Florida College studying Physiology to help fellow troubled students. Damarcus and I thank your supporters as well his high school teacher who helped turn him around! Daniel (Hernando) Thanks to you I get to attend PTEC to learn how to work on cars and provide for himself, his family as well be an asset to him community by being a working citizen. 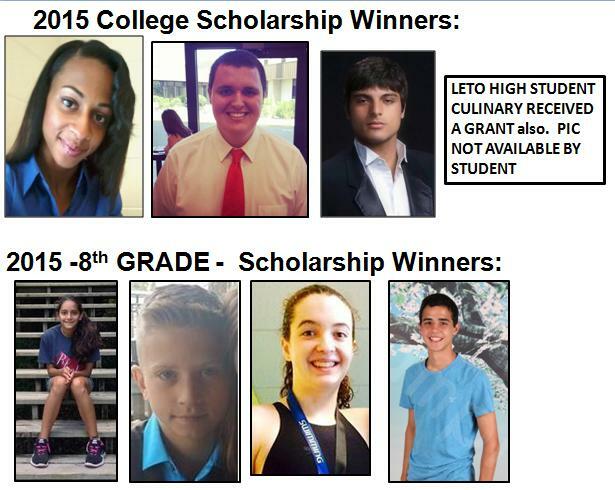 Nielsen Scholarship went to LETO HIGH Culinary student who will attend Culinary College! Plus Additional cash grants given in 2017: NIELSEN Tech Student; Ozona Christian School; Make Them Matter; Crystal Lake Middle School; American Cancer Pinellas; Lou Gehrig’s ALS; RCS; Leto High Culinary; Freedom High; SO FAR! On the date of our IRS Approval/Start Date in 2014 (8-14-2014) we granted TWO (2) Students with Educational cash scholarships. 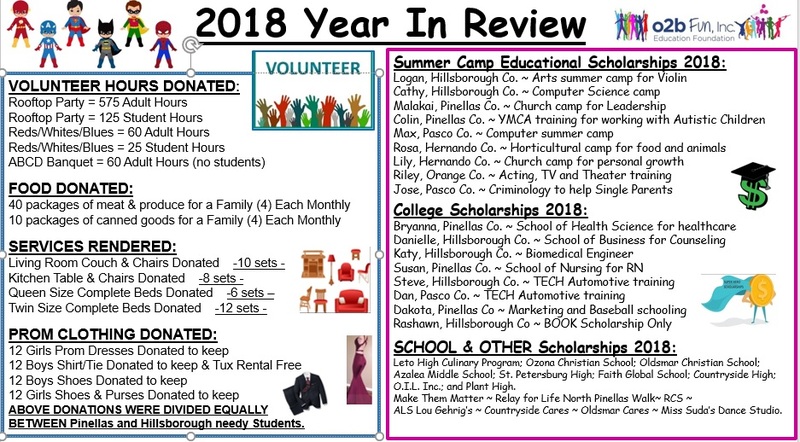 In May 2015 (our first full year in business) we granted EIGHT (8) Students with Educational Cash Scholarships plus we provided to five (5) Tampa Bay Community businesses with Cash Grants to further their programs! 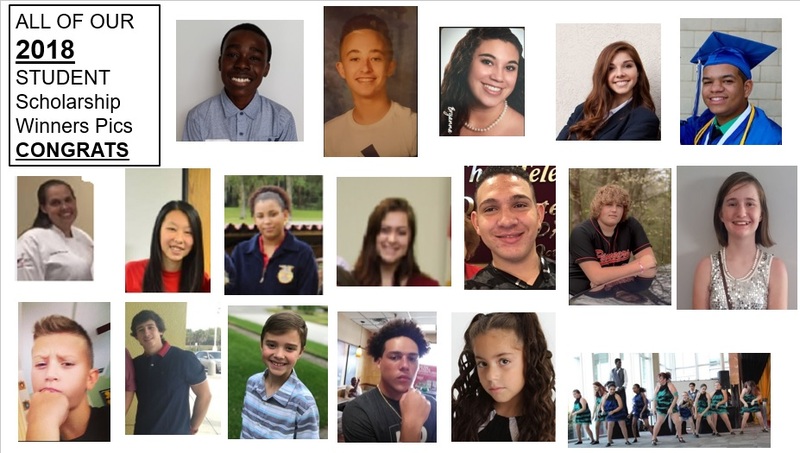 In June 2016, we granted TEN (10) Tampa Bay Area Students with Cash Educational Scholarships. In June 2017, we are set to grant Eight + (8) Tampa Bay Area Kiddo’s with Educational cash scholarships! BIG THANKS to our 2016 DONORS! BE SURE TO FREQUENT OUR SPONSORS! Note we had five (5) Winners with no available Pics! MICHAEL (Tarpon Springs Md.) Thank you for the 2016 Middle School Scholarship that I used to attend MFuge with my church. What an impact this has made in both my career choice and growing my faith. ALEC (C’side Academy Md.) Thanks to all the people who give to o2b Fun as you allowed me to grow this summer with my 2015 Educational Summer Camp scholarship without this I could not stay engaged in my future career choice. CHAD (Webb Md.) Thanks for your scholarship that was used to attend summer Band Camp at the University of South Florida. AUSTIN (Beth Shields Md.) My scholarship money went to attend a week long iD Tech camp in Jacksonville, which is for coders, and gamers. Using adobe and other engines I will keep my mind fresh in high school to be prepared for college. Thanks! APRIL (FL State) April will graduate from Florida State with and she plans to travel to the Dominican Republic for one month to learn Spanish Medical terminology for serving Florida Families. NINA (Pinellas Park High) Excited to win this scholarship and Thanks to o2b Fun Scholarship I get to peruse my career choice of First Responders by attending Sea School for Coast Guards. USCG here I come and thank you supporters of o2b Fun. KENAN (#1 SHEP) Thanks for the SHEP Award scholarship that allowed me to pursue my horticultural passion. DANIEL (#2 SHEP Pasco High) Thanks to o2b Fun and your supporters I won the second SHEP award and am able to attend PTEC for automotive training so I can get a job to help my family. PAUL (#3 SHEP Crystal River) My family and I am so grateful to the supporters of your business that allowed me to attend Computer Programming courses at University of Tampa. Additional grants in 2016: Walk for Life Pinellas; American Cancer Pinellas; Lou Gehrig’s ALS; Countryside Cares; Make them Matter; Oak Park High; Leto High Culinary; Nielsen Grant; Lilly of the Valley Pantry; Bee Well Health; Freedom High; Big Promise Studios; and RCS. MAX’S NOTE: Thank You to o2b Fun, Inc, their Board of Directors and Supporters for the May 2015 Educational grant given to my son! Max enjoyed the 2015 Robotics Arduino & C Programming Summer Camp at the Tampa Preparatory School in Tampa. This camp is all about building circuits and learning how to control those electronics with C Programming. Thank you o2b Fun, Inc for allowing my son to enjoy this educational experience as we would not have had the funds to send him without your full support. Thank you so Much for helping to encourage his interests! DARNESHA’S NOTE: Darnesha made a decision to continue her education by attending Law School in Gulfport Florida after applying for and being accepted in seven (7) different colleges. As a mother we are so proud of Darnesha and grateful o2b Fun, Inc for your support in allowing our daughter to fulfill her dreams. As an attorney or soon to be attorney you know our daughter will be giving back to her community in every aspect. Again thank you on behalf of our family and our lovely daughter. ADDITIONAL 2015 Grants went to = Make Them Matter; Walk for Life Pinellas; Relay for Life American Cancer; Lou Gehrig’s ALS; Oldsmar Cares Gala; Freedom High School needs and Countryside Cares! 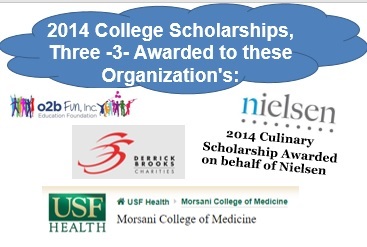 ONE Derrick Brooks Foundation Student grant; AND ONE FSU School of Medicine and Plus a grant to Nielsen Tech Student. PHOTOS we not provided nor any thank you notes. FYI ~ DISCLAIMER: Ever seen one of those plate-spinning circus acts? Hence this message and what follows is designed only to be transparently honest! Let me paint the picture for you. I work from home; I have no secretary or any other help at all. It’s just me. I maintain two -2- websites, one -1- blog, six -6- social media sites, and I do all of the solicitation/creative/marketing/requests/mailings/calls/follow up calls/letters/pickups/meetings/school contacts/school follow ups/referrals/leads and everything required to keep this business going while making our events as awesome as I can. 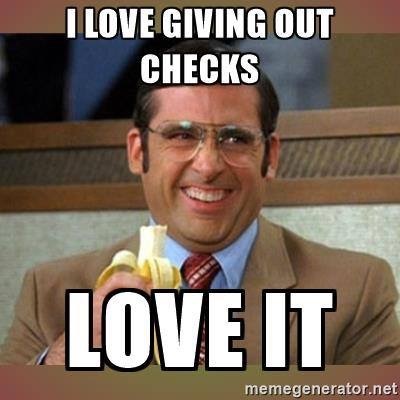 I do not take out any Salary, No utilities, Not any car wear tear, No gasoline expenses, I Only reimburse myself for event expenses, I print in black-and-white, I hand deliver mail to people if I can otherwise I mail so we can give ALL of the Funds Raised to Your Tampa Bay Area Kiddos!! This is Why I can Honestly say 100% of Funds Raised goes to Your Kiddos! The REAL HEROS come to us in the form of: Donors, Sponsors, Contributors, Attendees an Gifts that YOU give to make Scholarships possible. Because you care about the future of our community, we invite you to join us in making a difference. Your contributions will help fulfill the dreams of deserving students who might otherwise lack the resources to pursue those dreams. We sincerely thank you for donating, sponsoring, supporting and attending events … THANK YOU! -OR- Go online through our secure PayPal account at http://www.o2bfun.org/tickets-1.html where your donation OR Tickets ordered helps you connect students with Educational Scholarships to, EDUCATE + EQUIP + EMPOWER Florida Students! LAST – Did you get a new laptop, iPad, Android/iPhone or other technical toys for the Holidays or your Birthday? Want to donate the old ones so we can Gift Them to needy students or their families! Like we said all donations are appreciated and will be given to those that will not only fully use them but greatly appreciate them! THANK YOU! CONTACT US: Email at o2bfun@yahoo.com anytime; Snail Mail – P.O.Box 2533, Oldsmar, FL 34677 or Call 727.641.6600 know that messages will be returned within 48 business hours maximum. Middle School Grants = this is for 8th Grade Students that are headed into high school after the summer break. We at o2b Fun, Inc feel this is a major adjustment going from Middle to High School and wish to keep students educationally interested therefore, we are granting a complimentary Florida Educational Camp to students. High School or College Bound Grants = this is for Students needing assistance in attending a Florida College. We will provide a once in a lifetime grant to a Florida College of your choice upon selection and after completing the application. Purpose:The advancement of education by creating and performing fund-raising activities to provide funds for assisting Students based upon need and/or merit. Mission:To educate, equip and empower people on all educational levels without thought to nationality, creed, color, handicaps, and belief. NOTE = Each emailed application will be considered by the Board of Directors and Grants provided upon selection as well as Funds allow us. 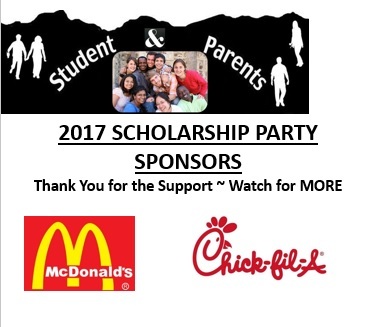 Understand that we are granting scholarships and support as the funds are available to o2b Fun, Inc and through the support of grants, sponsors, donors and event attendees. Incorporated on August 17, 2014 with the Support and backing of Retired Coach Tony Dungy and Ryan Nece as their “educational Charities of Choice.” This means is Prior to starting this not for profit on May 16, 2014 Brenda Geanakos sought out support and was given permission to use Tony and Ryan’s names as supporters of o2b Fun, Inc also know that they have their own not for profit organization to which we hope you support.